As the days pass and the river rises, we wonder if we will soon be on a little island as we were in 2004. We could not make it over a 100 meters outside of camp without swimming. The trails are flooded, but not like in the summer of 2004, or at least not yet. I have been venturing out the last several days to paint and photograph all the amazing life here in the rainforest. Yesterday I noticed the Cactaceae I am so enamored with, Disocactus sp., is on the verge of blooming, yet again! I am ready and I have three chances since it has three buds at various stages of development. The last time I did not get the opportunity, so this just proves that all good things come to those who wait. The orchids in the Orchid Garden are blooming profusely and the diversity is simply amazing. I have been on a drawing, painting and photo frenzy. I must admit I have taken somewhere around 7,000 photos thus far and if I keep this up I am going to have my cameras and hard drives pluming with smoke. That sounds about right. I love it and plan on it, that’s why there’s always the backup. Fortune is where you find it and I found it today in the rain. I call it a natural style car wash. I took the nasty tent, which bromeliads have been torn apart inside of leaking all sorts of stinky water, the bromeliad poncho and work poncho and set them out in the heavy rain to be washed. Now I do not have to scrub them, nor do I have to worry about wasting water. Excellent. Today it rained for a large portion of the day, so Shawn and I spent most of the day catching up on all our office busy work. Shawn’s new assistant, Travis, spent most of his time in the Puma Plot avoiding the rain by standing under dense foliage. He was working the gps and received excellent signals resulting in sub-meter accuracy. The Harpia plot should be done in about one more week. The small brilliant leaf hopper I studied today was also fascinating. It was brilliantly colored with fuscia and cerelean blue. I thought it was so truly amazing, like a small little jewel glowing as if it were a neon sign, He was only a few millimeters long. This little guy appeared to have a symbiotic relationship with the ants on a small liana. Every so often if the ants did not come by to collect the clear liquid excreted from his hind end he would shoot it out over his head with much force. The first time he did this I was observing his quite closely and I nearly got it in the face. What a terrific little insect. 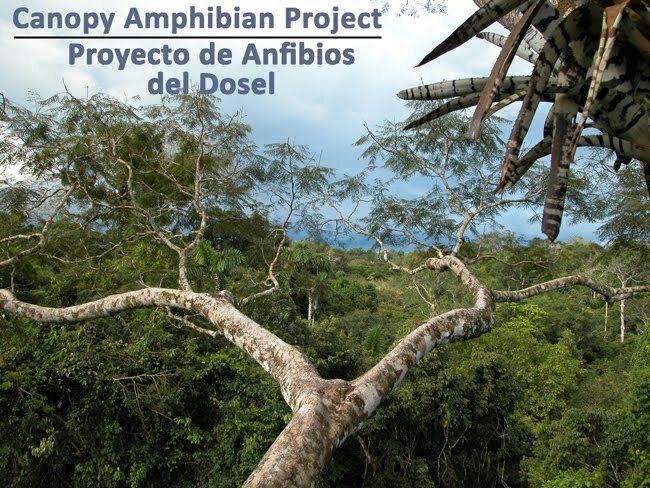 My love for the rainforest is a deep passion. It is in my thoughts always and I have so much to say through my art that there is not nearly enough time in the day or my lifetime even to paint about all the aspects I observe and learn from books, magazines and researchers. My interaction with researchers provides me with first hand knowledge that supports my conceptual work. My intention is to take this forest to every person in some form or fashion if they are unable to make it here themselves, so they can see the beauty, importance and mysticism for themselves. Our dear friend Carl back home in Austin, TX sent us a wonderful haiku that I would like to share with ya’ll. We are finding frogs. Just the other day I found Edilorina perezi. What a fantastic find amongst the leaf litter, so difficult to see. Only our second time to find this species here at TBS. Charne found yet another Nictamatis rugaceps. This time it was a juvinile. She’s got the eye and she’s quick with the hands. Noah has been going to the volleyball court every night, which is loaded with frogs, to find elusive frogs we have yet encountered. The rainy season is here and the frogs are abundant so he is trying to curb the itch of catching everything in sight. The other night he caught Hyla marmorata and Hyla parviceps. We have only one more tree to climb. Shawn is so good at climbing and gets up there so fast. He has become so agile with his spider-webbing climbing system, it's amazing. Luckily our last tree to climb is close to camp with no serious flooding to wade through. The river is rising and the trails are beginning to flood, which can only mean one thing, MORE FROGS! Of course there are other species reproducing, but the frogs are in heaven right now, calling day and night. 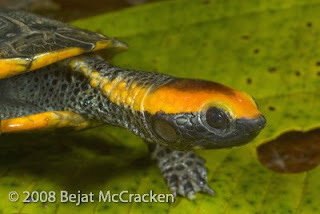 There is a small turtle that lives by our cabin, a species of side-necked turtle (photo at right). Shawn found him and we processed him and decided to move him to a safer location (so he wouldn' t get chewed up by the wed-eater, which was evident). Shawn placed him in a cabrada on the other side of camp and in a few days he returned to the open space next to our cabin. We decided to leave him and hope for the best. We notified the workers here, but it's hard to see what is under the grass when you have to deal with sweat-bees, wasps and other biting things. Plus, Lucha, the pet trumpeter loves loud noises and runs to the weed-eater to try to hang out right next to it. It is the strangest thing. And it's not just the weed-eater, but also the chain-saw, generator, music, people and just anything that makes noise. She seems to get depressed when there is not a lot of people in camp. That bird is the best pet, but I would NEVER take her out of the jungle. She would be so unhappy and surely die if she were not in the jungle. She is an insectivore and loves to follow people around to not only hang out with them, but eat the insects they stir up along the way. 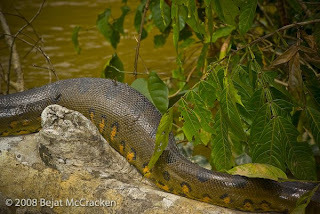 We did catch an Anaconda (photos located above) a few days ago. It was about 7 or 8 feet long (6 1/2 meters). It seemed to have eaten something fairly recently since it had a large lump in it's mid-section (photo located at left below). Don Mayer, one of the guides here said that it may have eaten a Squirrel Monkey. After we took photos, Shawn proceeded to lunge at the head, capturing him safely just behind the head. 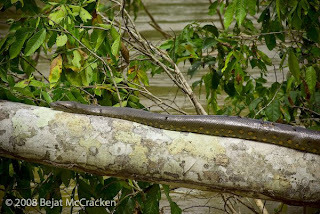 This constrictor was basking in the sun on a large log along the Tiputini River and as Shawn had a grip on his head the boat began to slowly drift away from the log. At this point Diego, the manager here at TBS, straddled the log to grab the hind end and Noah went for the mid-section. SUCCESS! The Anaconda was pulled into the boat and ready to be processed. We took a scale clip for DNA, measurements, weight, photos and videoed the entire process. It was our first time to catch and Anaconda and it was so very exciting. 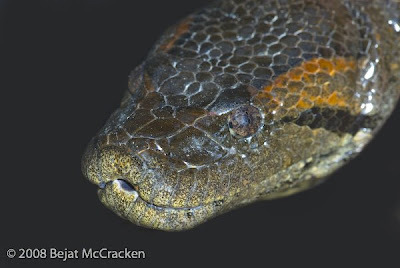 This non-toxic constrictor is elusive and mystical. There are may indigenous stories about Anacondas and in many cultures they are thought to posses powers and have spiritual qualities. What was so remarkable was the eyes. They possess the sense of darkness and strength. They appear to have two pupils, but the structure of the pupil is for vision above and below the water at the exact same moment. What a truly phenomenal specimen. I felt so honored to be in it's presence. Noah and Charne leave in two weeks and Shawn's other assistant, Travis, arrives on Friday. Tower I is near the tree on the Matapalo trail that we will be climbing next. We have saved this tree until last so that I could video the climb from this tower. We hope that it will be complete by the time we climb this tree. That will be some phenomenal footage because I will be parallel with the tree. "Many times a day we are graced by the beauty of Scarlet and even Yellow and Blue Macaws flying over head. Their brilliant color and graceful flight can only be matched by the Morpho Butterfly. It makes you stop in awe of the vision before your eyes as if you can't even imaging a more beautiful sight. It's like a dream into reality. That waking dream that keeps you wanting more so that you drift in and out of concisenesses. It is this breath of life that keeps one sane and pure in heart and soul." I think anyone with even the slightest inclination towards psychotherapy would assume that I continue to take field jobs in out of the way places to somehow assert my masculinity. To hunt, capture, colonize, dominate or whatever (all the great things white men used to be allow to do). Which, naturally, is why this job was like hitting the jackpot: climbing trees, catching snakes, shooting oversized sling shots etc. I could finally be the real man that I knew was hiding somewhere deep underneath the surface. 1) I was fishing and Charne decides to join in and basically catches a shark-sized piranha within the first five minutes. I only caught a 4 inch guppy looking thing. The guys cooked it up and brought it out to her at dinner. I think they did it just to humiliate me. 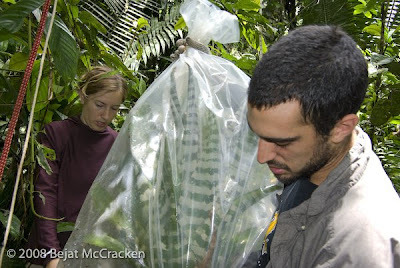 2) We found the cavity of the elusive Nictimantis rugiceps and I was nominated to catch that beautiful beast of a frog. So we went out that night, I climbed the ladder, put the net over the hole, shook the tree to flush him out and alas, instead, he decides to sink in there and hold his ground. The only way to get him is to reach in there and grab him. But my hands are too big. And now under “Collector” in the data book is written the name “Charne”. 3) I was bragging to everyone how I was finally getting to know the forest and could recognize certain areas and trees and know where I was even off the trail. Then I go out the next day to count bromeliads and count 124 on this one tree and think out loud, “Wow I just counted another tree near here yesterday that also had 124 bromeliads. What a coincidence!” I think you get it. 4) The BBC comes to Tiputini and wants to film a tree climb. What’s cooler than that? We get to the tree and my one job was to tie the rope in a daisy chain so it would unwind fluidly. It was all wrong, totally tangle. Mariano (one of the “Tigres”, the workers) and I spent the next 10 minutes untying knots, on camera. He did most of it. And speaking of the Tigres, how am I supposed to feel manly when these guys can do everything from tracking jaguars to carving canoe oars with chainsaws to weaving beautiful lampshades out of palm fronds? 5) I finally catch an edible sized fish. A nice catfish. It was sitting gulping its last breaths for 15 minutes and hadn’t moved once. Then somehow it summons the energy for one final leap and makes it back into the river. And now no one believes that I caught it and I don’t blame them. 6) We go to catch an anaconda and during the capture I get a fang in my finger. It bleeds substantially, even showing up on the video, and all I can think while we were holding it down and taking blood was “man, now I can tell everyone back at camp I got bitten by an anaconda!” And then, on the same freaking day, another researcher gets a bite from a huge constrictor on her leg, stealing all my thunder. Now no one remembers my bite.